"Placemats (Charrette)" (2011), acrylic and oil on panel. Neil Griess is an artist living and working in Omaha, Nebraska. He received his Bachelor of Fine Arts from the University of Nebraska-Lincoln in December 2011. His work has been included in group exhibitions in Omaha, Lincoln, New York City and Kansas City. In this interview Neil describes the interests, processes and methods behind his work. How does your hometown influence your work? I am from Omaha, Nebraska, a Midwestern city with a metro population of over 870,000. I grew up in a 50+ year-old suburb, which exists between what could be called the center of the city and the frontiers of westward sprawl. Despite it being in a good school district with a strong tax base, much of the commercial presence in the area is low performance retail, where strip malls have gone through makeovers of varying success, or in certain cases been demolished altogether. I found the existing aloofness towards these places close at hand to be perplexing as a child, particularly in relation to the radius that my friends and I could reasonably travel on foot or by bicycle. I still carry this perspective towards scale as it pertains to use and transportation, and it directly impacts my work. I find myself always asking questions about how needs can be met at the local level, and what kinds of tools people can use in order to shape the process. 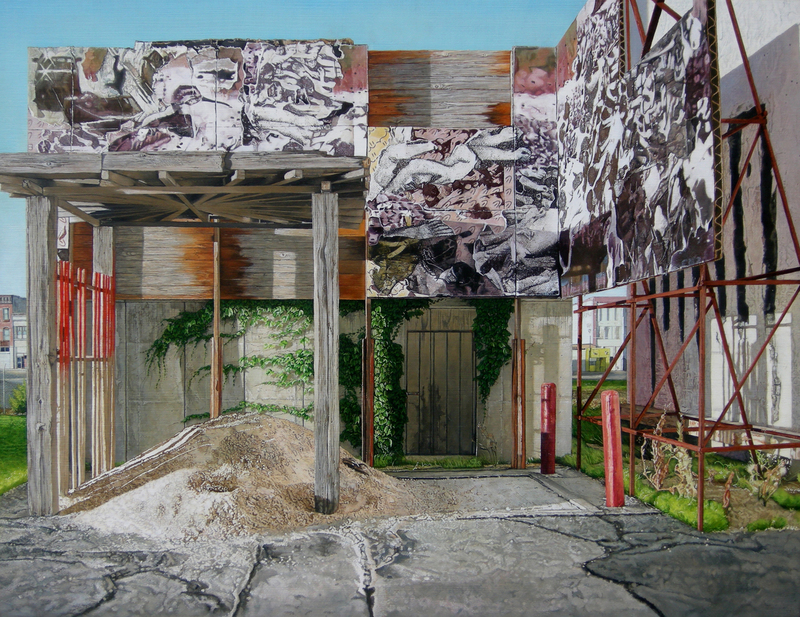 "Site Measure" (2010), oil on panel. Omaha has both the greatest number of millionaires per capita and the highest percentage of black children living in poverty of any city in the country. It wasn’t until high school that I began to recognize how divisions of class and race play out spatially in the city. I began to see the relationships between spaces that were familiar to me and those that were not due to various forms of exclusion. "Untitled (Sift)" (2009), oil on board. Tell us about your creative process; how do you approach your artwork? For each of my paintings, I first build a miniature model that I arrange and photograph. The resulting photographs form the points of reference for the painting. I have been doing this for around four years. It came about based on a desire to coherently combine architectural details from various sources, sources that were largely chosen based on their affective qualities. As I sought to better pin down what this work was about, I read more about the environmental design fields, and began to be drawn to temporary and/or small-scale urban interventions. My method of working eventually became a way to represent my own landscape architecture and urban design ideas — a fairly recent development. My current body of work is centered on modular landscape design, exploring multiple facets of potential use. What are the themes that you explore through your work? In his 1953 essay “Formulary for a New Urbanism,” Ivan Chtcheglov describes a shifting city condition designed to illicit specific emotional responses from the city’s inhabitants through sounds, sculptures and other environmental factors. At the same time, the inhabitants are able to freely reorganize their surroundings as they choose. The text served as a seminal document for the Situationists. While it is a quirky, idealistic, and ultimately problematic vision, I still find it to be a compelling one, in that it suggests a democratization of urban form. I am interested in how people interact with the built environment, particularly when those interactions are unexpected, or unplanned. These interactions often make power dynamics visible. The Occupy movement has been fascinating in this regard, revealing what physical spaces are available for public organization and expression, and under what circumstances. In the case of Zuccotti Park, the law became an asset: as a Privately-Owned Public Space, it is not subject to the usual public park curfew. What was briefly occupied was the space between property and the commons, and I love that. The horizontal decision-making structure of Occupy is worth considering in relation to Chtcheglov and utopia-minded thinkers in general. Utopia suggests consensus, but what kind of consensus is possible when striving to provide equal representation of a multitude of subjectivities? In her essay, “Antagonism and Relational Aesthetics,” Claire Bishop asserts that visible antagonism is a healthy indicator of democracy. The utopian still has a place in her analysis, not as a stable goal but as an instrument used to envision the possible. I like to think of the spaces that I depict as existing around moments when utopia is glimpsed through some collaborative effort. When and why did you start to paint? I began to take my art practice seriously during my junior year of high school in response to the passing of my uncle — hyperrealist artist Kent Bellows. It was a difficult time to lose someone like that, as I had a lot of admiration for him, and my identity was just beginning to take shape. Although I had always been painting and drawing, I really pushed myself after his death because I felt that I had missed the opportunity to relate to him on a deeper level. Since then, I have had to shift from trying to measure myself against someone else towards focusing on my own interests, addressing them with my strengths and perspective. This is an incomplete process, and probably will be for as long as I make the kind of paintings that I do. My uncle's work was a central part of my visual culture growing up, and I can’t really divorce myself from that. Do you consider your work mainly political or aesthetic, or perhaps a combination of the two? I think in terms of the political very frequently, but the fact that I am making paintings places me pretty firmly in the latter category. I am ok with that. I think it is important to recognize one’s contradictions in order to really run with them. I could address the issues that I care about more directly through a relational art practice, yet I am using pictorial space to flesh out these concerns. I am interested in the places where communities can flourish, yet I generally keep to myself, preferring isolated places (my images are devoid of people, after all). A painting should first work as a painting, and I spend a lot of time with that. Any political impact seems negligible, but there are other ways to participate, of course. For the time being, I feel that I have reached a workable balance between my divergent inclinations. Credits: Artwork and photos by Neil Griess. A fabulous interview to go along with these stunning paintings. Neil is truly an inquisitive artist and mature in his investigations. fascinating scenes. like experimental workshops in cities, at the end of a day's work. Neil's uncle and his influence shows through in this work. Especially when taking in the dynamic angles and hyperrealistic emphasis on detail. 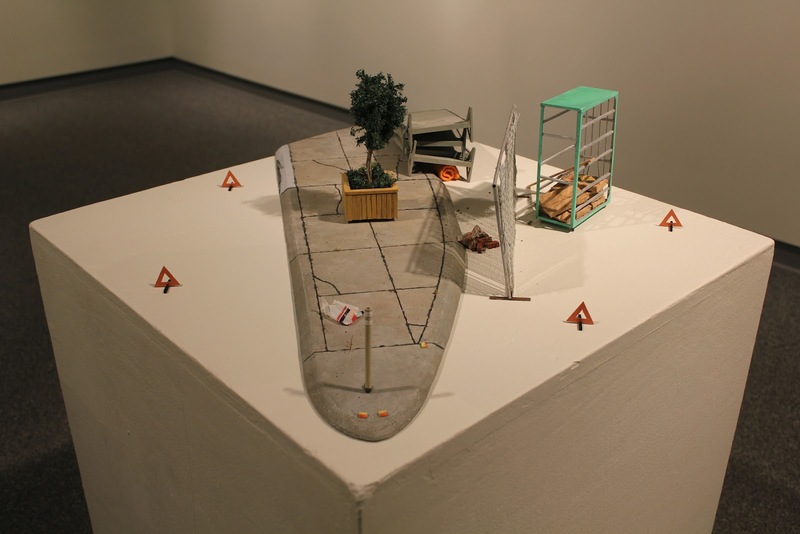 These miniature scenes and paintings strongly personify the short-lived strip malls and their peering predecesors beneath. Breath-taking complexity--visually and ideologically--that takes me in and makes me want to explore these places like I would have as a child. Fantastic all around. Glad to feel fine art of this careful quality in our city. Too Many Startups in Cities?